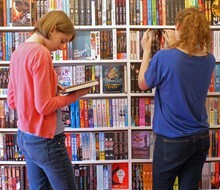 Village Books is located in the heart of lovely leafy Dulwich Village. We are a small but beautifully stocked award-winning independent bookshop with a terrific range of books to suit all the family. Our children’s section is particularly important to us, catering for new-born babies through to young adults. As well as books we have a good range of stylish cards, wrapping paper and book-related gifts, and we’re always happy to gift-wrap your purchases. We sell and redeem National Book Tokens. 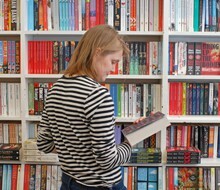 Best described by many customers as the perfect family bookshop, we are here to serve all the needs of the book lovers in Dulwich. Visit Village Books, and we’ll introduce you to a treasure-trove of books and writers that you’d never experience simply by buying on-line. Order books over the phone or click on the link above to send an email. You can sign up to our mailing list here to keep up-to-date with future events. They know about books and can discuss them, and when you order them they arrive quicker than you can say Amazon. This is the best bookshop I know. A small shop, packed with stock, it is run by helpful and knowledgeable staff, who obviously enjoy reading, and are willing and able to advise customers. Orders arrive within 24 hours. 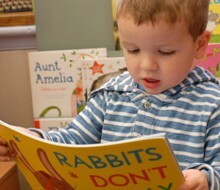 Book selection for children is particularly good.